The Canadian Jewish community traces its history back to 1760. That year Aaron Hart, an English Jew, rode into Montreal with the triumphant British army of Sir Jeffrey Amherst. Upon leaving the army, Aaron Hart settled in Quebec and was followed by other Jews. Daring individual Jewish fur traders occasionally ventured into the Canadian interior. In 1878, the Coblentz brothers and their families migrated across the United States to St. Paul, Minnesota and then up the Red River to Winnipeg, the frontier metropolis of Manitoba. Subsequently, other Jewish families arrived from the United States. The Russian massacres of 1882 brought an inpouring of Russian Jews to Manitoba. Among the 1882 pioneers were those who dreamt of becoming farmers in the new country. To a group of some forty families was given a grant of land by the Canadian government some 200 miles northwest of Winnipeg. But the group had had no previous farm experience. After a struggle with the soil for several years the project failed. Gradually the families returned to Winnipeg or emigrated south to the United States. Later arrivals in the 1890s and 1900s also became homesteaders, and for a period of about twenty-five years there were a number of successful Jewish farm settlements in Manitoba and in the neighboring provinces of Saskatchewan and Alberta. At one time there were some 800 Jewish families on farms. Eventually most of these families re-settled in larger Jewish communities including Calgary, Edmonton, Regina and Saskatoon, and the largest number in Winnipeg. Today there remain about one hundred Jewish families on farms of the Canadian prairie. Winnipeg has the third largest Jewish community in the Dominion. Nine out of every ten Jews in the province live there. 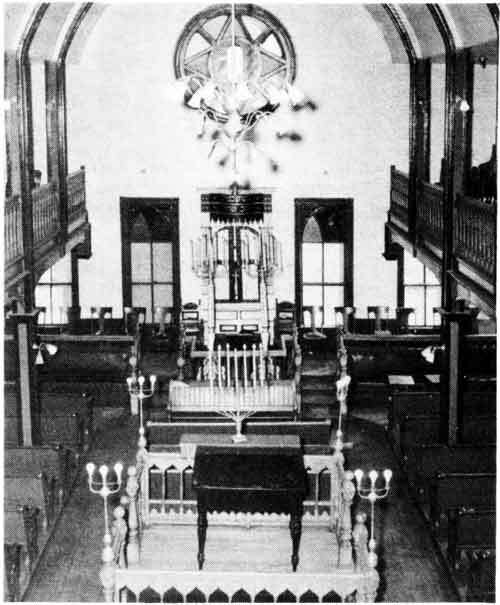 Several small synagogues with quarters in private homes were established beginning with 1885. The Shaarey Zedek Synagogue (1889) and the Rosh Pina Synagogue (1892) have flourished through the years and in recent times both have built modern houses of worship in new sections. Nine smaller synagogues are to be found in the older Jewish neighborhood. Interior, Rosh Pina, built 1892. To provide proper Jewish education for the young members of both congregations, the first Talmud Torah (vernacular school) was established in 1902. Today some 550 children attend the Hebrew day school and afternoon classes in a modern structure completed in 1952. The portion of the community favoring Yiddish-language schools established the Peretz and Jewish Folk Schools in 1913. Both merged into one thriving educational institution in the 1930s and today 600 youngsters are enrolled at the Peretz Folk School. Today there are 19,000 Jews in Manitoba. Many have risen to high rank in government, journalism, commerce, and the fine arts. Culturally alert, the Jewish community supports three Anglo-Jewish newspapers, a new Young Men’s Hebrew Association (Y.M.H.A. ), a Hillel Foundation and Chair of Judaic Studies at the University of Manitoba. Manitoba Jewry is pleased with its colorful past and looks forward to a productive future. Attending Hebrew schools at Rosh Pina and Shaarey Zedek Synagogues are 650 students. The Winnipeg Jewish community is very proud of the fact that practically every Jewish child receives a Jewish education. To provide opportunity for advanced Jewish study, Maimonides College was established several years ago. Jews have lived at one time or another in at least 118 of Manitoba’s towns and villages. In the main they have owned general stores and have been on friendly terms with the various groups including English, Scotch, Icelanders, Ukrainians, Dukhobors, Mennonites and French.